Guide in 'Crafting & Gathering' published by Caimie Tsukino, Aug 18, 2015. Ch2: The Concept of “Collectables”, and what do they do? Ch3: How to gather an item to make it a useful Collectable item? Ch10: What are Tomes of Regional Folklore? I have been searching the web for quite a bit, yet I have not seen any good comprehensive, step-by-step guide that teaches newbies like myself to play the “Collectables” end-game for Blue Scrips & Red Scrips. So I decided to write up this guide to help those who are in need. 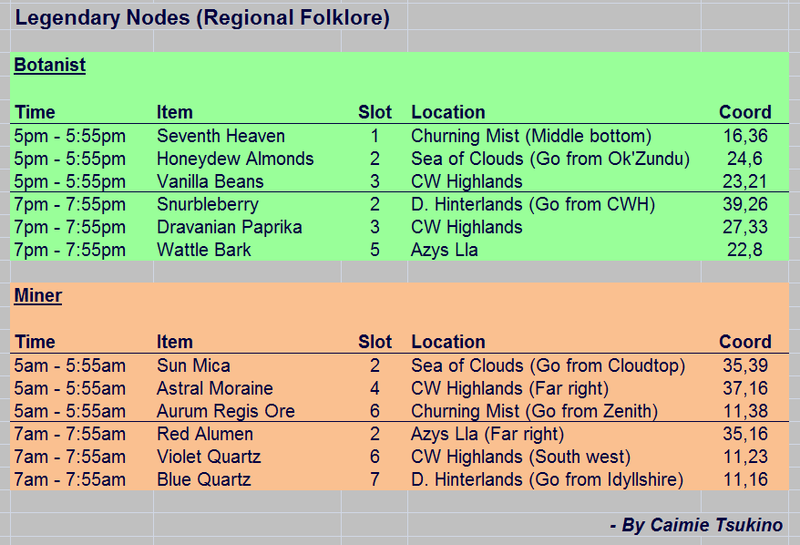 On top of that, I will also cover the basic Unspoiled Nodes, Legendary Nodes (Folklore), Ephemeral Nodes (with Aetherial Reduction), as well as Favors. So hopefully, this gathering guide will be as complete & comprehensive as possible for Heavensward end-game. 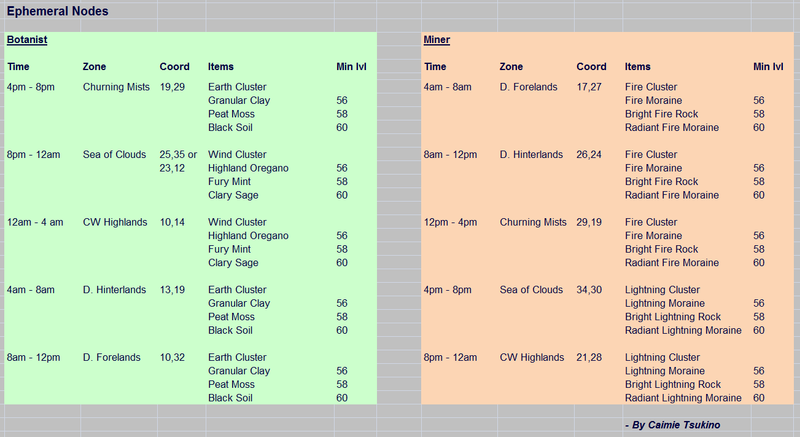 However, this guide only covers Miner & Botanist. Sorry Fishers, but you're not covered here. 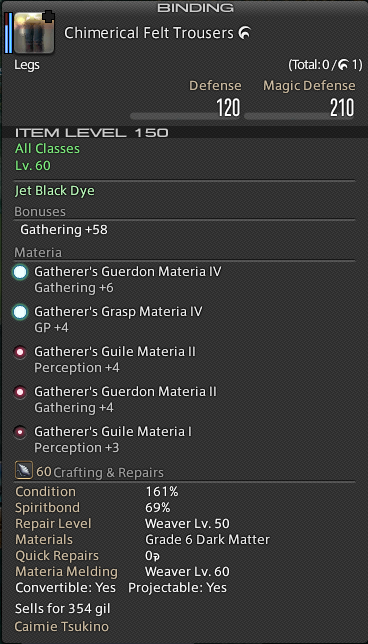 In the world of gathering, “Collectables” are gathered Unspoiled items that cannot be sold on the marketboard nor used in crafting. The major purpose of a Collectable is to be turned in (at Mor Dhona or Idyllshire) for Blue Gatherer's Scrips & Red Gatherer's Scrips, which are for buying all kinds of gatherer-specific items, like gear, Tomes of Regional Folklore, and Favors. Each Collectable item has a stats called “Collectability”. Item with higher collectability can be exchanged for more scrips. Because of this nature, the same items can have different Collectability. Thus, Collectable items cannot be stacked, and each will consume 1 inventory space. Also, you need to be at least level 56 to earn scrips. Before level 56, you can only gain exp from turn-ins. After level 56, you can start earning Blue Scrips. And after you have reached level 60, you will then be able to earn Red Scrips. - The "Collectable Appraiser" at Mor Dhona or Idyllshire will give you a list of Collectables that can be exchanged for exp, Blue Scrips and Red Scrips. 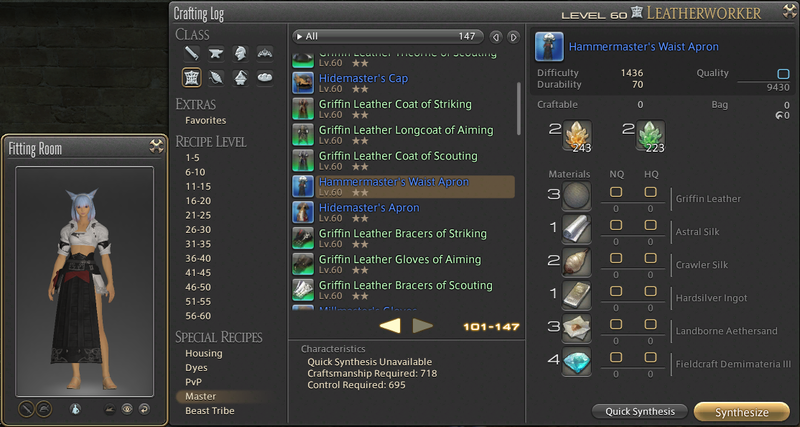 - A list of all regular unspoiled items in Heavensward. 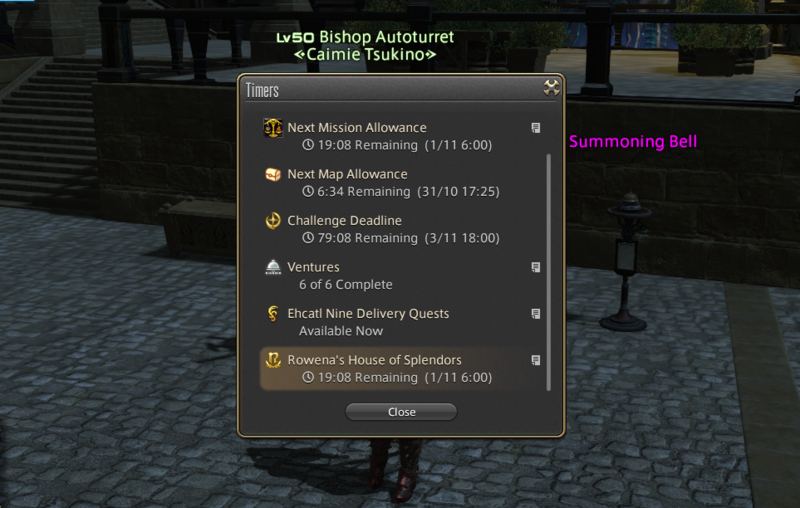 Warning: HW Unspoiled Nodes only appear for 55 Eorzean minutes! After engaging an Unspoiled Node, activate “Collector’s Glove”. It’s a button that does not consume anything. You can activate or deactivate it any time at will. First, you have to uncover/reach the Unspoiled item. To do so, you can either hit the slot directly, or use Toil of the Mountaineer. If you’re visiting a node for the first time, feel free to use Toil (and DO NOT use Collector’s Gloves in this case). The items will all show up as hidden with 25% success rate. So you need to use Sharp Vision III / Field Mastery III to increase that by 50%, resulting in 75%. Gather all those different items for the first time so you don't have to use Sharp Vision III / Field Mastery III again next time. 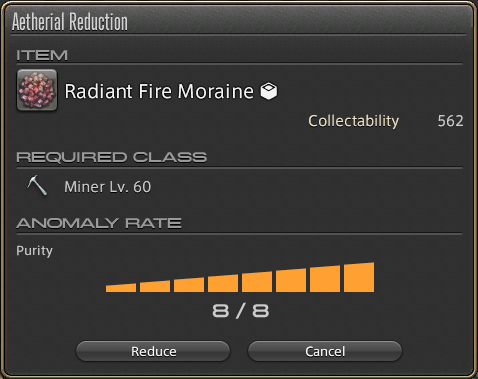 If you’re NOT visiting a node for the first time, Toil is a very bad idea that will ruin your chances of getting any useful Collectables (much like how Toil was in ARR, which I highly discouraged. Please see my old ARR Gathering Guide), because it burns away too many GP. Instead of Toil, you should use 1 attempt to hit the slot directly to reach/uncover the item. The only exceptions are when you can’t reach the item with 1 attempt, or if the item is at random slots, so you have no idea where it is, then Toil will be a valid thing to use. After the item is reached, click on the item while “Collector’s Glove” is active. This will open up a new panel, which is the “Collectable Gathering Panel”. The goal of this little game, is to use multiple skills that can increase the item’s “Rarity”, and then collect the item(s) before you run out of attempts. “Rarity” of a gathered item is directly translated into the “Collectability” stats. Thus, items with higher rarity it will give slightly more scrips when handed to the "Collectables Appraiser" NPCs. 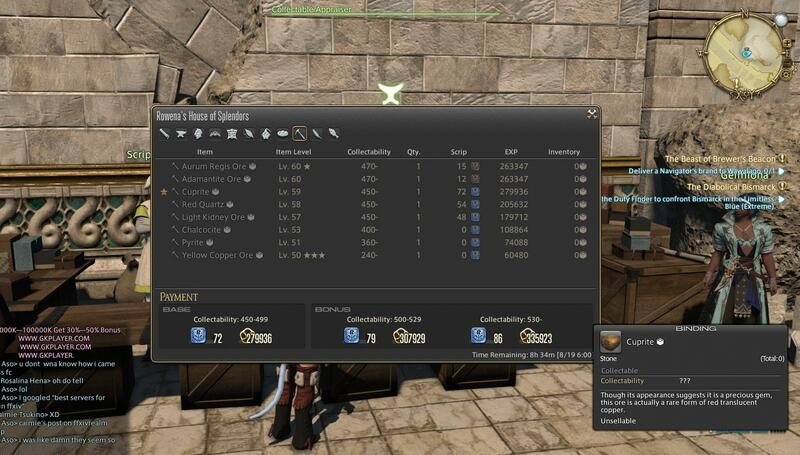 The skills that can increase “Rarity” of an item are called “Appraisals”. Each Appraisal skill you use to increase “Rarity” will also increase “Wear”, so there’s a limit to how many appraisals you can use. 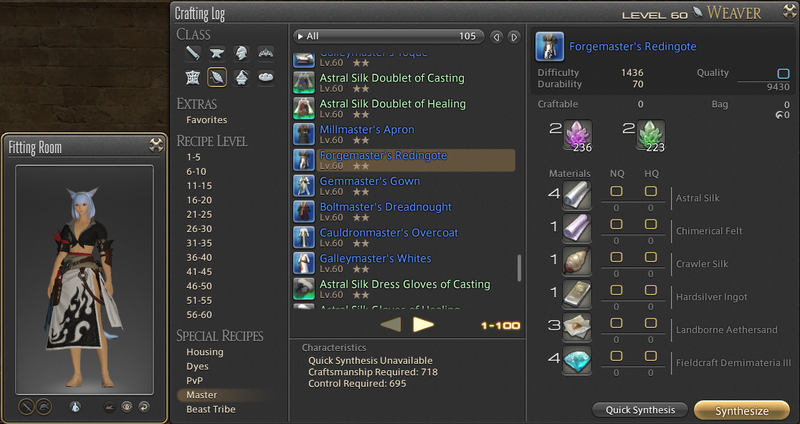 Each item has a “Wear” of 0/30, which is a similar but opposite concept to “Durability” in crafting. In crafting, if you failed to complete the item before durab hits zero, you will botch. In gathering, if your item’s wear is too much (>30/30), your chance of collecting it will drop to 10% (which is practically zero). Apart from increasing “Rarity” and “Wear”, each Appraisal skill will also use up 1 attempt. Thus, the more Appraisals you use, the fewer items you can actually collect at the end. Once you have burnt through all your GP to increase “Rarity” and used up most of the “Wear”, hopefully you still have 1 or more attempts left to actually collect the item. After that, you want to send those items to the "Collectables Appraiser" NPCs at Mor Dhona or Idyllshire to exchange for scrips. The challenge of this little game, is that your Collectable item must reach certain amount of Rarity (or "Collectability"... same thing) before the NPCs will pay you scrips. However, the more you push Rarity, the more Wear you will generate (which is like a burden to the item before it’s over-worn), and the fewer attempts you have left to actually collect the item. Also, even though items with higher Collectability will give slightly more scrips, it's no better than 2 to 3 items with lower but acceptable Collectability. So keep in mind, 2 items of lower but acceptable Collectability is BETTER than 1 single item of extremely high Collectability. Thus, the ideal case is to reach a good amount of acceptable Rarity (so the NPC will take it and pay a good amount of scrips), while maximizing the attempts remain, so that you can actually collect the item as many times as you can during a run. e.g. When you first engaged a node, you had 6 attempts to begin with. You used 1 attempt to uncover the item. Then you used 4 attempts to push “Rarity", and achieved very high rarity. In the end, you had only 1 attempt left, so you would only be able to collect 1 item. In contrast, if you used only 3 attempts to push “Rarity”. This will leave you 2 attempts left to collect the item. Thus, you will get 2 items. For Case 1, which you pushed Rarity with 4 attempts, your Collectability will be higher (540 Collectability), so the NPC may pay you 86 Blue Scrips for the one item. For Case 2, which your Collectability might be lower (470 Collectability), the NPC may pay you only 72 Blue Scrips for each of the two items. But 2 x 72 is still much higher than 86. Thus, Case 2 is a better choice that will give you more scrips per run. Increases item wear by 15. 30% chance Discerning Eye activates. Reduces next item wear increase by 5. Nullifies item wear increase for one of the next three appraisal attempts. All appraisal skills are based on your Perception stats. Thus, higher perception will make your appraisals stronger. Methodical Appraisal (Meth) is the standard skill to increase Rarity. Instinctual Appraisal (Instinc) relies on RNG (Random Number Generator). If lucky, you can increase Rarity more than Methodical Appraisal. But if unlucky, then less. It also increases wear more than other appraisals. Impulsive Appraisal (Impuls) gives slightly less Rarity than Methodical Appraisal. But it has a 30% chance of activating Discerning Eye. Discerning Eye is a standard skill that we usually use before each appraisal to increase Rarity gain by 50%. A lucky activation of Discerning Eye from Impulsive Appraisal would mean saving you 200 GP on the next Discerning Eye. Thus, allowing you to use that 200 GP for Single Mind instead. Single Mind lets your next appraisal consume zero attempts. Thus, allowing you to use 1 extra attempt at the end to collect 1 extra item. 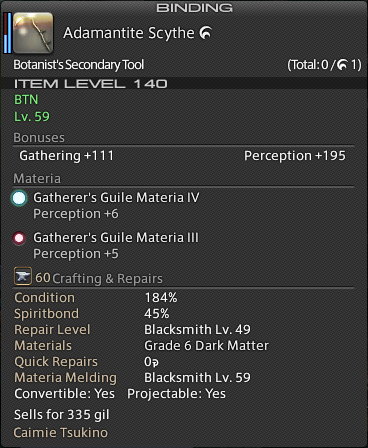 Even though the tool tips says "Perception x1" for Meth, it does NOT mean you will get 500 Rarity from 500 perception. The REAL final number of Rarity you get from an Appraisal depends on the item level. e.g. 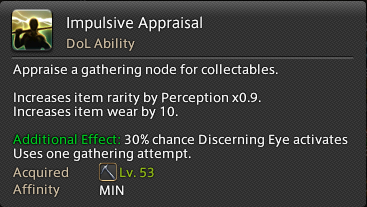 if you get 100 Rarity on a level 58 item with 500 Perception, you may get only 90 Rarity on a level 60 item with the same perception. The tool tips really failed to explain how it works. All the rotations listed below require at least 600 GP. 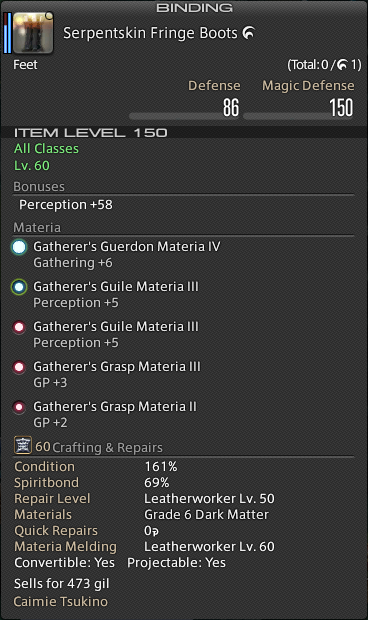 If you do not have sufficient GP, either upgrade your accessories, or do some melds/overmelds of materia, or eat a GP food. …which allows you to push Rarity pretty high, and get 2 Collectables with very decent Collectability. Thus, we can call this the “2 Collect Standard Rotation”. …the 3rd Methodical Appraisal will be slightly weaker, but the use of Single Mind allows you to have 1 extra attempt in the end. Thus, this generates a “3 Collect Standard Rotation”. If your stats are too low, and neither the 2 Collect Rotation nor 3 Collect Rotation give you sufficient Rarity, then you either have to gear up better, or modify your rotation into a 1 Collect Rotation. It still uses 600 GP. But instead of using Discerning Eye before the 3rd appraisal, you use Utmost Caution to reduce Wear. Thus, you can now use a 4th appraisal without overshooting Wear. 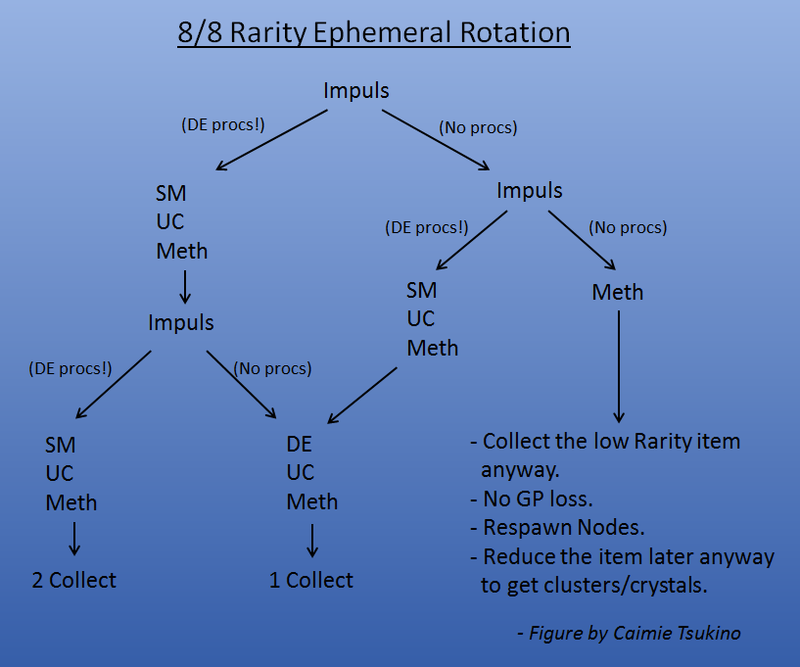 With 2 Meth appraisals buffed by Discerning Eye (each 150% efficiency), and 2 other Meth appraisals alone (each 100% efficiency), this rotation gives rise to a higher amount of Rarity than the Standard 2 Collect Rotation. However, due to the use of 4 appraisals, you will lose 1 extra attempt. Thus, in the end, you can only collect 1 item. We call this the “1 Collect High Rarity Rotation”. Next, we examine the use of other appraisals apart from Methodical. Methodical Appraisal gives 10 wear. Instinctual Appraisal gives 15 wear. The 2 Utmost Cautions we used before each of our 2 Instinctual Appraisals help to reduce their wear by 5 each. Thus, total wear from each Instinc is only 10. What we have done here is buffing each of the Instinc with a Discerning Eye. Instinc gives between 80 to 150 potency, and the DE adds 50% potency. So assuming you get 80 potency, you will end up with 120 total potency for the Instinc. Where as if you get 150 potency, then you will end up with 150+75 = 225 potency on the Instinc. We can call this the “Instinctual Gambler Rotation”. The weakness of this rotation is obvious. The Rarity it provides is RNG based. You can potentially end up with 2 useless items and wasted the whole run. I DO NOT recommend this rotation. …base on the “procs” of Discerning Eye from Impulsive Appraisal, this rotation allows you to collect up to 4 items with very high Rarity. As long as any of the 2 Impulsive Appraisal procs, you will still get up to 3 items. If no proc occurs, it will become a rotation similar to our 2 Collect Standard Rotation. We can call it the “Standard Impulsive Rotation”. 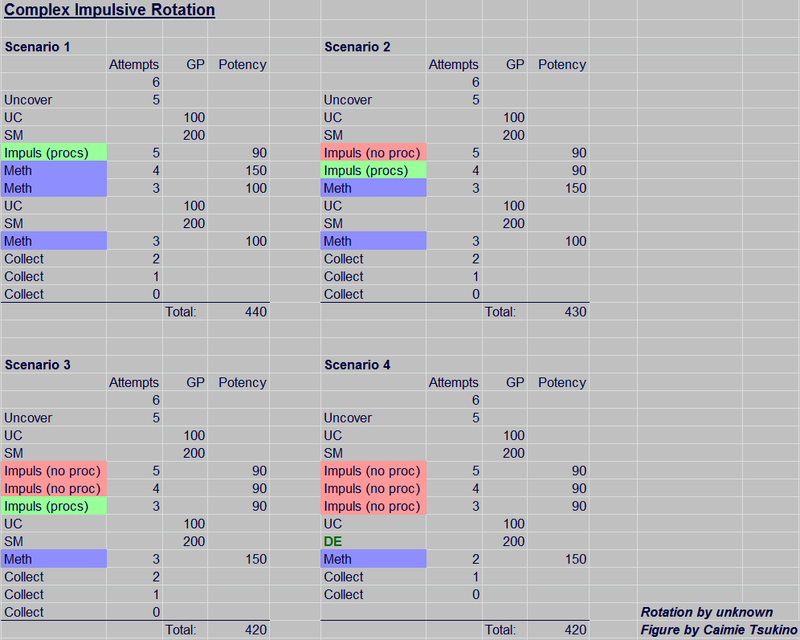 Another Impulsive rotation that has been circulating on the forums is something I call "Complex Impulsive Rotation" (Thanks to PirateCat who supplied this to me!). This rotation eliminates the possibility to get 4 items in one run, but it has a higher chance of obtaining 3 items per run. In some cases, it also provides slightly higher Rarity. Furthermore, as long as you get 1 proc, you can potentially modify the 2nd SM into a DE to gain more Rarity. You will sacrifice 1 attempt in doing so, but if you need that extra Rarity, then it's something that can be done. The down side of this rotation is that it involves 2 extra actions. So it takes longer to complete than the Standard Impulsive Rotation. If you're running out of time during your gathering session, you may not have enough time to complete the rotation and collect your items. And as its name suggests, it's slightly more complex to remember. *Amendment: You can actually use all 3x Impuls during the "triple appraisal phase" to continue proc-ing more DE. It might actually be more beneficial. Because if it procs, you get much higher collectability in the end. 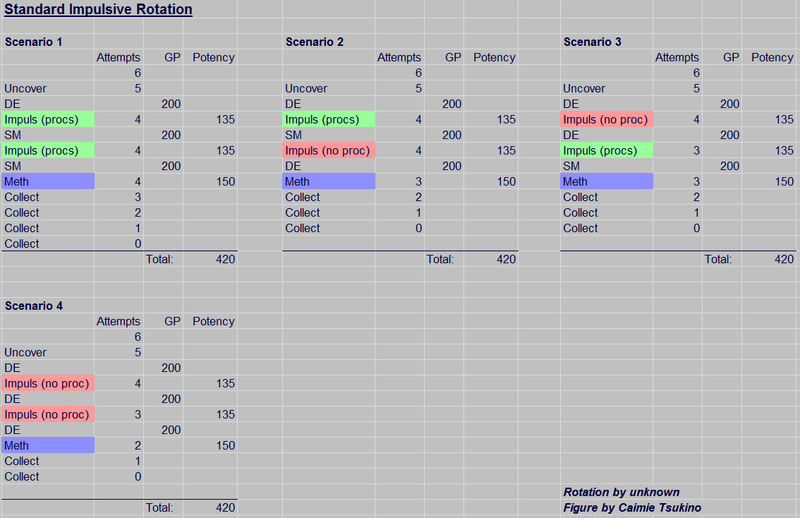 (1) 3 Collect Standard Rotation - for obtaining 3 items (>450 Rarity) per run for "Blue Scrips" turn-ins. (2) Standard Impulsive Rotation or Complex Impulsive Rotation - for obtaining 2 to 4 items (>470 Rarity) per run for "Red Scrips" turn-ins. 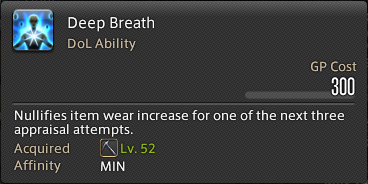 So far, I have not found any good use for Deep Breath (300 GP). It consumes way too many GP, and is just difficult to fit into any practical rotations. If you happen to know any good rotations with Deep Breath, please let me know. Last Ditch (50 GP) also seems pretty useless, as it is really a "Last Ditch" after you messed up... Chances are that you won't even have that 50 GP left to use it. So it's a pretty useless skill. While your perception stats contributes to Rarity, your gathering stats contributes to your success rate of collecting the items. Even if your gathering is as high as 600+, your success rate on the Collectables would only reach about 95%. That remaining 5% sometimes will get to you and make you miss a collection. Therefore if you have as many as 650 GP, you can use that extra 50 GP for "Sharp Vision" / "Field Mastery" before collection to push success rate to 100%. To overmeld to 650 GP is very expensive, but to achieve around 630 GP isn't so bad. 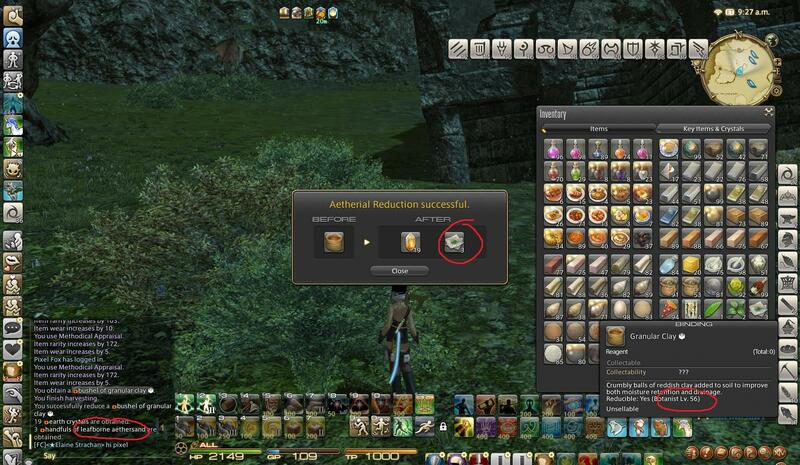 After that you can use cheap GP food like Antelope Stew (sold at the Gold Saucer vendor) to reach 650 GP. The current minimum goal of overmelding is to reach 600 gathering, 645 perception & 600 GP. The gathering stats guarantees access to HW 1 star items from Legendary nodes, and the perception / GP stats for collectables rotations. 647 gathering (possibly less) can uncover Folklore items with one attempt. And 650 GP allows the use of an extra Sharp Vision / Field Mastery to guarantee the collection of Collectables. NOTE: If you are too poor to overmeld much, consider getting just enough stats to obtain "Red Scrips". Once you have a steady flow of "Red Scrips" per week, you can accumulate enough "Rowena's Token (Gatherer's Red Scrip)" to trade for i180 tools/gear from the Splendor Vendor, like the Minekeep's Pickaxe or Fieldkeep's Hatchet (See Chapter 9 last picture). As you can see, for accessories, I currently possess only the new earrings. I am too reluctant to remake & and pentameld heavensward accessories. My old pentamelded ARR accessories seem to do just fine. I have sufficient stats for almost anything. I have only 644 gathering, but i can eat a gathering food for 1 star items. I have 638 GP, and i always use an Antelope Stew to reach >650 GP for collectables. As you can see, i have not completed the overmelds of this hat. But my current stats are quite sufficient already. 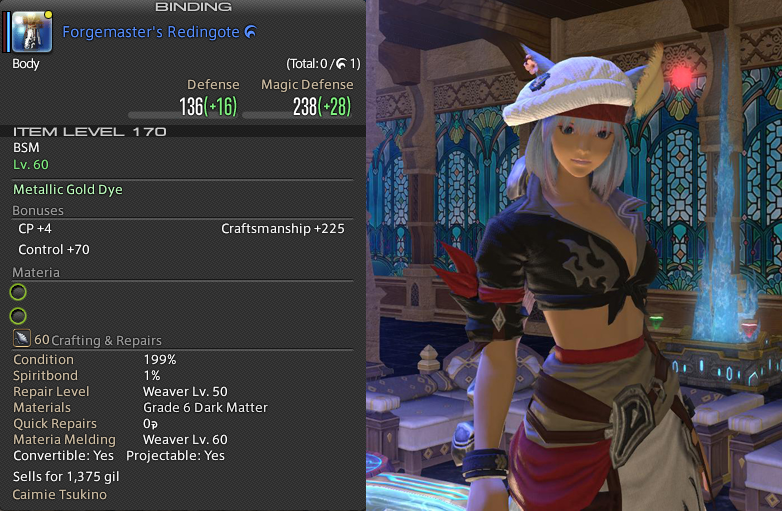 For the vest, i tried to get close to the melding cap. Again, i didn't penta meld my gear. It still seems fine at the moment. For the pants, i think i hit the cap. I would have used tier iii materia if i hadn't. 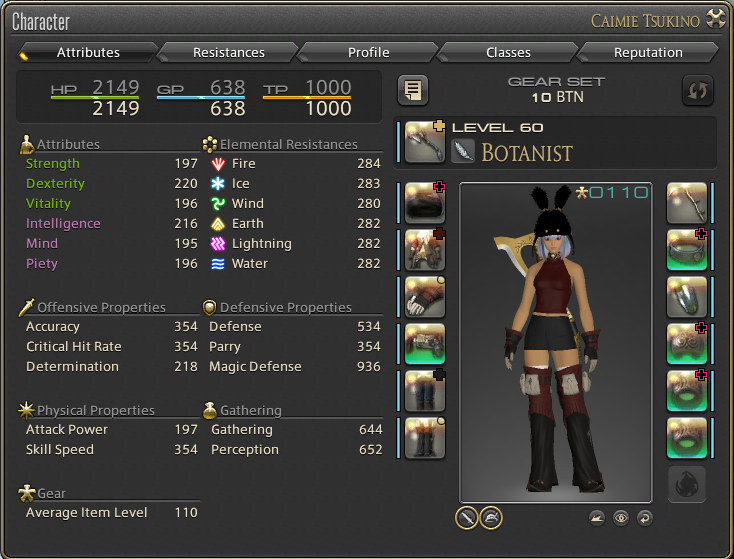 I think i maxed the boots too... Or close to maxing the cap of them. I also did my best to max the cap of these earrings. A very mild overmeld on the mainhand & offhand (below). I can push on more overmelds if i want to, but it seems quite enough for me at the moment. 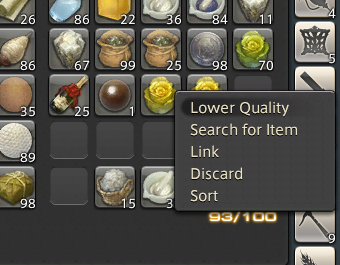 Most of the old ARR accessories seem to be sufficient. It is not uncommon that while we test on different rotations, we end up with Collectables with insufficient Collectabilty (Rarity), and the "Collectables Appraiser" NPC won't accept them. In that case, you can convert some of these items into regular items by right-clicking it and select "Lower Quality". After acquisition of Blue Scrips & Red Scrips from the "Collectable Appraiser" NPC, the scrips can be used at the "Scrip Exchang" NPC of Idyllshire or Mor Dhona. 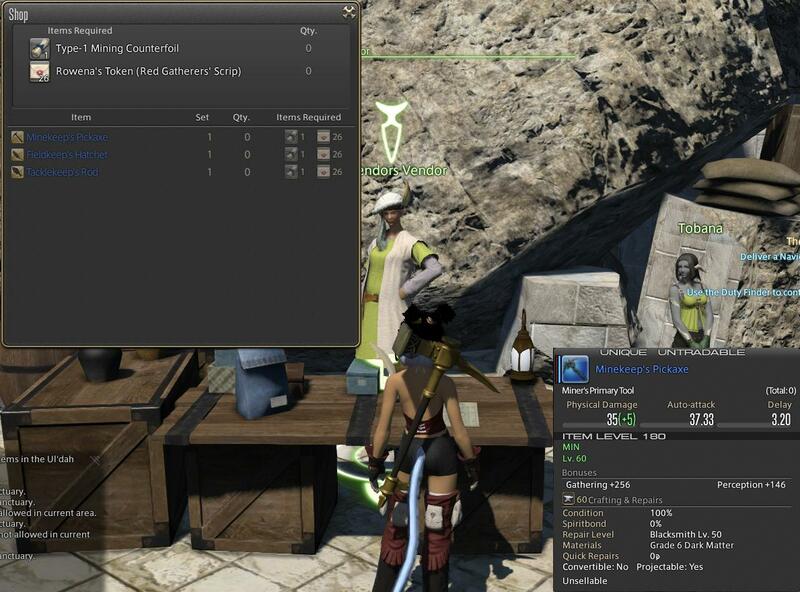 At the "Scrip Exchange" NPC at Idyllshire, You can use Blue Scrips to buy gathering gear, or "Rowena's Token (Blue Gatherer's Scrip)". You can also use Red Scrips there to buy "Rowena's Token (Red Gatherer's Scrip)". 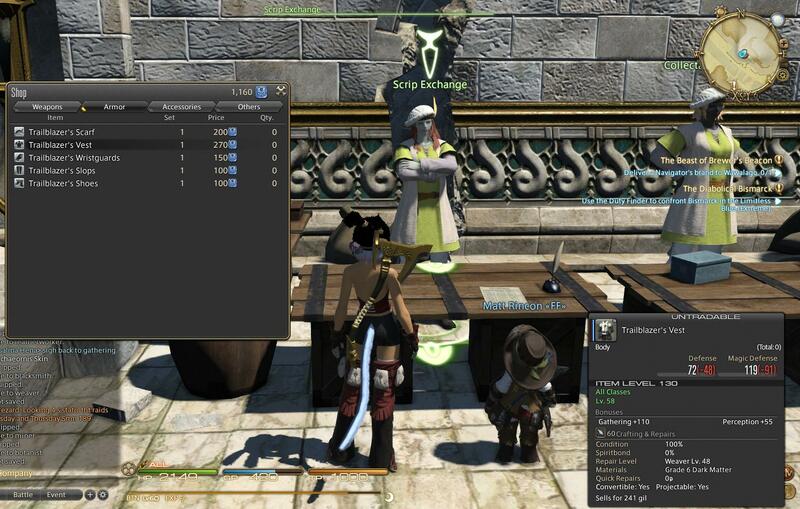 The "Scrip Exchange" NPC at Mor Dhona allows you to spend your Blue Scrips. 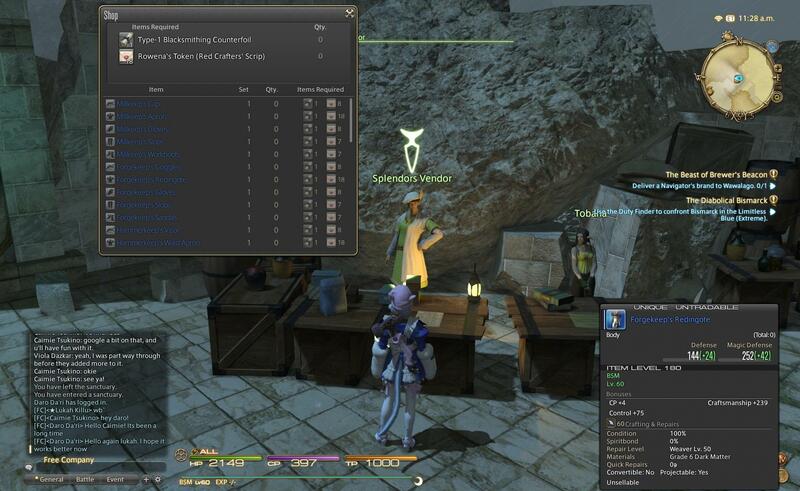 But unlike the one at Idyllshire, the Mor Dhona NPC doesn't let you spend Red Scrips. - There are Blue/Red Crafter’s Scrips & Blue/Red Gatherer’s Scrips, and they don’t mix. Crafter’s Scrips are earned via crafting. Gatherer’s Scrips are earned via gathering. The scrips for Disciple of the Hand (DoH) & Disciple of the Land (DoL) are completely separated. 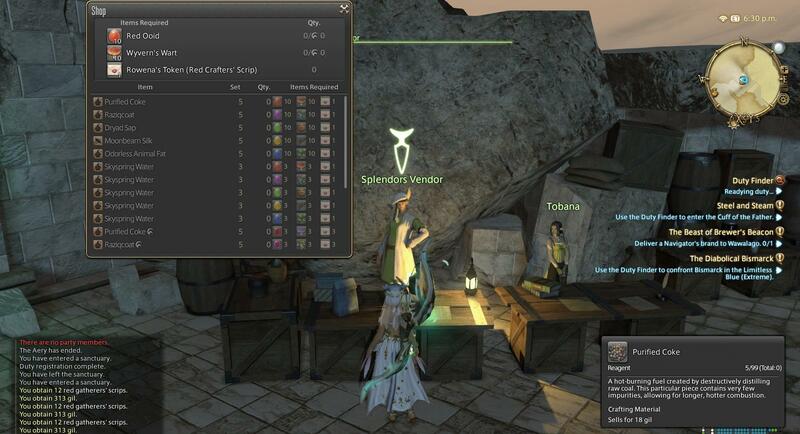 - Trailblazer's gathering gear are available at the Scrip Exchange. 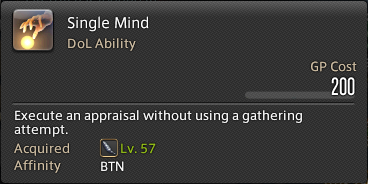 But I DO NOT recommend them if you already have BiS from ARR. 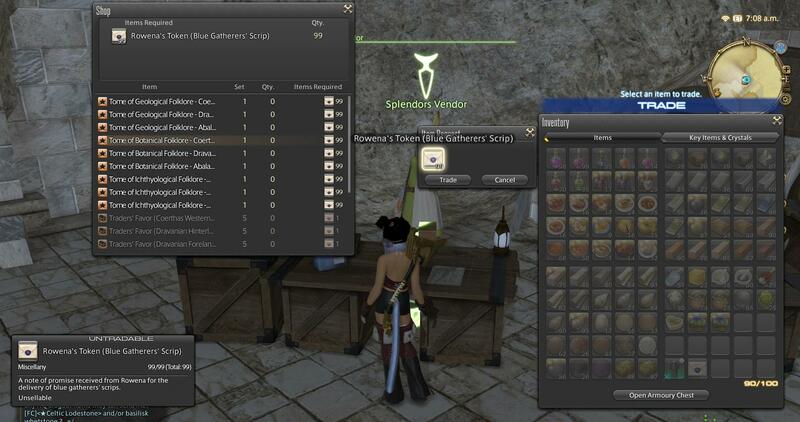 At the Splendor Vendor at Idyllshire, you can use "Rowena's Token (Blue Gatherer's Scrip)" (need 99x Tokens!!! Equivalent to 4950 Blue Gatherer's Scrips!!! >_< ) to buy "Tomes of Regional Folklore". 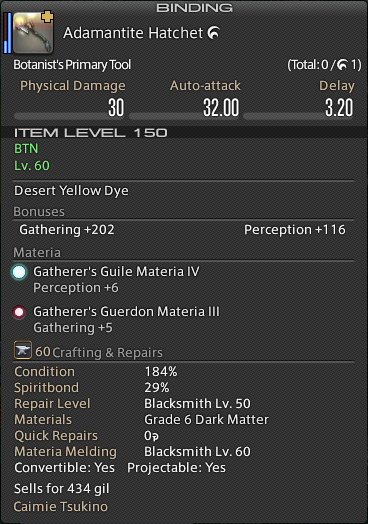 You can use "Rowena's Token (Red Gatherer's Scrip)" to buy i180 end-game gathering gear or "Favors". - Tomes of Regional Folklore & Favors at the Splendor Vendor. - i180 tools/gear at the Splendor Vendor. All that work to get scrips! 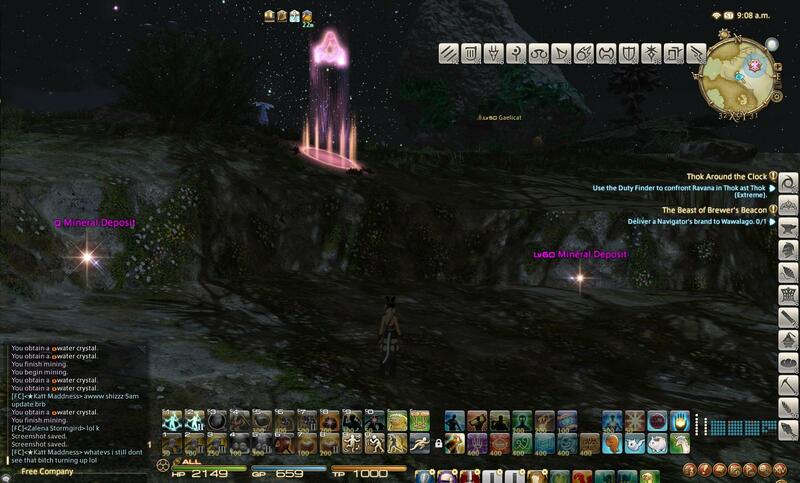 One of the reasons is just to earn access to gathering “Folklore items”. They’re basically the equivalents of “Master Recipes” in crafting. You have to earn it. Once earned, you gain access to new "Legendary Nodes". E.g. 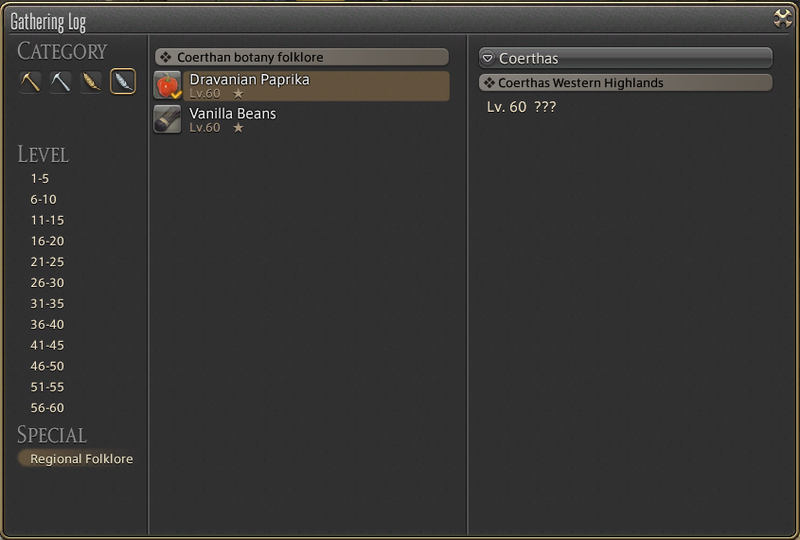 Tome of Botanical Folklore - Coerthas gives access to Dravanian Paprika, which is an item needed for crafting Heavensward Culinarian Master Recipe 1 star item, Seafood Stew. Each Folklore tome requires 99x Rowena's Tokens (Blue Gatherers' Scrip) (such a grind!!!). They're purchased from the Splendor Vendor at Idyllshire. All Legendary Nodes require a minimum of 600 Gathering to obtain items and 645 Perception to a chance for HQ. To uncover item with 1 hit requires 645 Gathering. 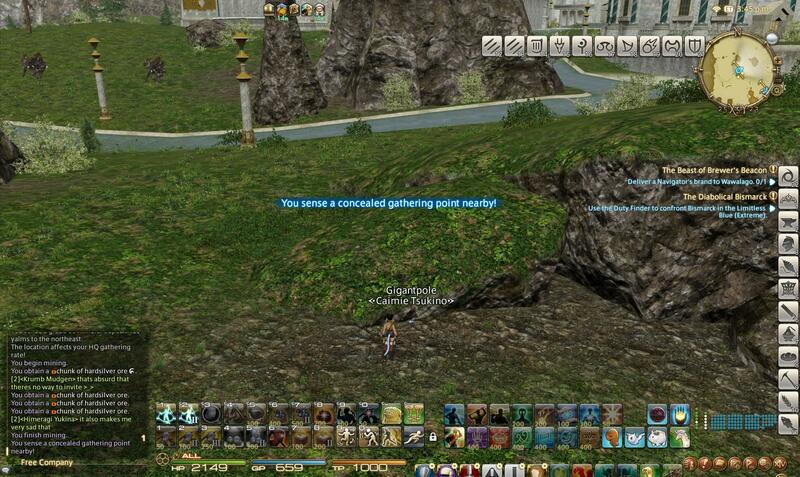 Note: I have confirmed that 644 Gathering is NOT sufficient to uncover the item with 1 hit. 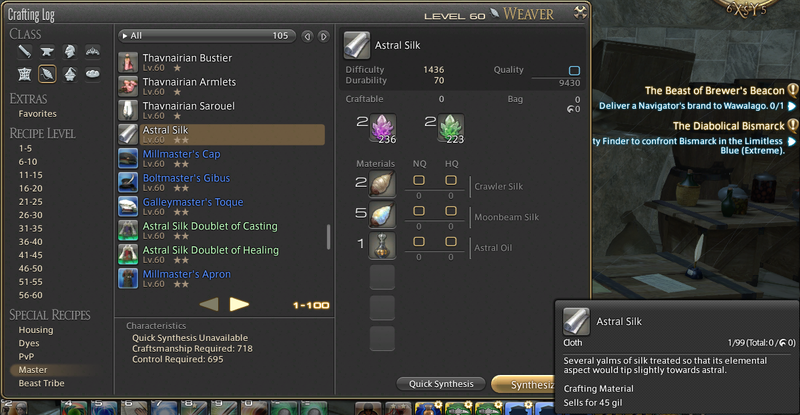 The cheap food Antelope Stew I use from the Gold Saucer vendor happens to add 3 Gathering apart from 21 GP. My final total of 647 Gathering was sufficient to uncover the item with 1 hit. On 14 Sep 2015, versita reported that 645 Gathering is sufficient to uncover with 1 hit. Thus, the minimum is now officially determined to be 645. If your gathering is way below this range, you may use the more expensive Spinach Quiche to gain more gathering stats. These items are very demanding on stats. 650 Gathering will only give around 80% success rate. If you go for quantity, you can use 500 GP on King's Yield II / Blessed Harvest II, and then use 100 GP on Sharp Vision II / Field Mastery II. You will get about 95% success rate. If you go for HQ instead, you can use 300 GP on Unearthed II / Leaf Turn II, but you should use another 250 GP on Sharp Vision III / Field Mastery III to secure your hits at 100%. If you have 650 GP, and you really wanna gamble it, you may go for Unearthed II / Leaf Turn II, Sharp Vision I / Field Mastery I, Solid Reason / Ageless Words, and harvest at 85% success rate. But you will likely miss 1 or 2, and you won't be able to use Deep Vigor at the end anyway. I do not recommend this. 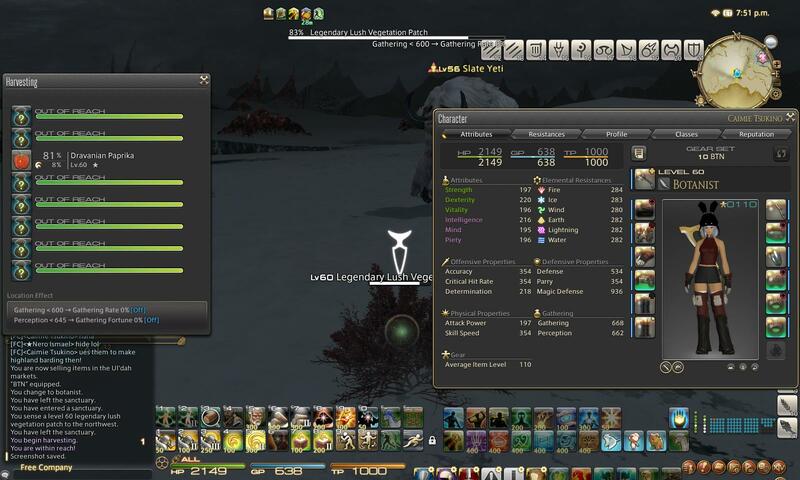 Tome of Ichthyological Folklore – Coerthas ------------> ??? Tome of Ichthyological Folklore - Dravania -------------> ??? Tome of Ichthyological Folklore - Abalathia's Spine ---> ??? - After purchasing a tome, new 1 star items will show up in the Gathering Log. - Legendary Nodes are just like regular Unspoiled Nodes, except the stats required to get the items are harsher. Here, I have used a gathering food that adds 24 gathering points & 10 perception points. Yet, even with a total of 668 gathering, I'm still only getting 81% success rate on the item. - Folklore items are also known as "1 star items" for gathering. 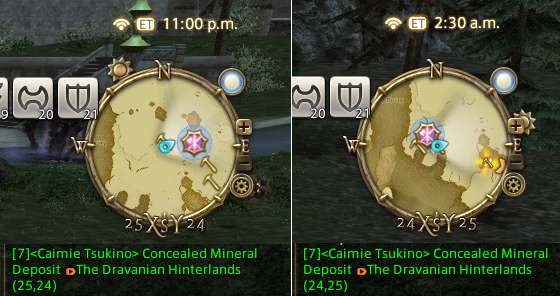 The Legendary Nodes disappear in 55 Eorzean minutes after they spawn. Try not to show up late! Ephemeral Nodes are nodes that allow you to obtain Collectables, which are to be used for "Aetherial Reduction" to obtain precious crafting mats such as Dawnborne Aethersand. When you have a level 56 gathering class or crafting class, you will be able to unlock this by taking the quest "No Longer a Collectable" at Lydirlona at Mor Dhona. Notice that lvl 58 & lvl 60 items are HIDDEN. So they only appear sometimes by chance. Much like any other nodes, when you first see a new item, the item is hidden with only 25% chance success rate of uncovering. You will need to deactivate your Collector's Glove, use Sharp Vision III / Field Mastery III to get a regular item on your first time. After that, you can respawn the node, and start using Collector's Glove for harvest it as a Collectable. 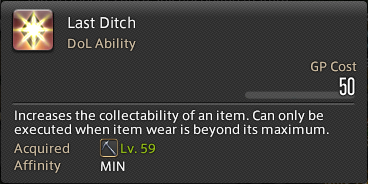 To gather useful items from Ephemeral Nodes, you must have the Collector's Glove active, and then push Rarity to as high as you can before collecting the item (will need at least 600 GP). 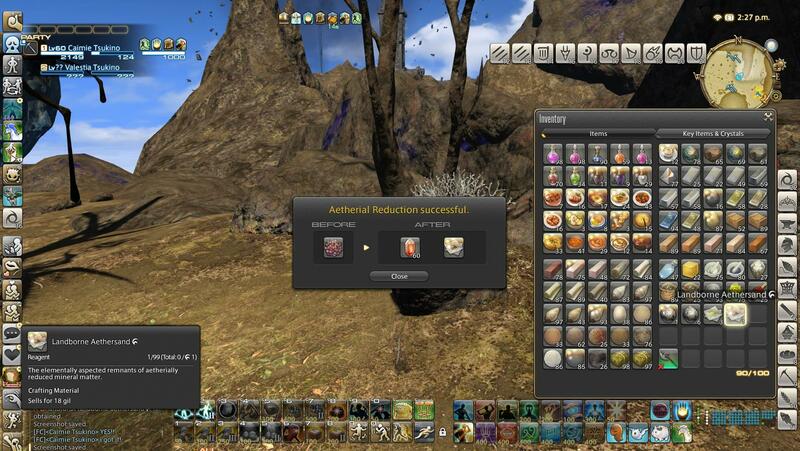 After acquiring the Collectable, you can right-click on the item, and select "Aetherial Reduction" to break down the item. The stats "Rarity" is translated into "Purity". Low Purity items will give you Clusters & Crystals. High Purity items will give you special aethersands. - The lvl 58 & 60 items are hidden and only show up sometimes. If you don't get them, you can always collect the lvl 56 item without spending any GP, then respawn the node, and try again. Ephemeral Nodes gives only 4 attempts. However, unlikely regular Unspoiled, the items do not need to be uncovered. Thus, you can save 1 attempt. Yet, unlike the Blue / Red Scrips game, here you want to achieve THE HIGHEST RARITY POSSIBLE. Because only items with high rarity/purity will give you the good stuff from Aetherial Reduction. Thus, "quantity" does not matter as much as "quality" (Rarity/Purity) here. You want to use a rotation to boost Rarity to its very limit. Here is how the basic idea works for constructing the best rotation for Ephemeral Nodes. Since we now have 1 extra attempt than we do on a regular Unspoiled Node, the idea is to spend all 4 attempts on appraisals to achieve maximum Rarity, and use 1x or 2x Single Mind (200 GP each) to buy 2 extra attempts for collecting. But because each appraisal give 10 wear, 4 appraisals will give 40 Wear (over-worn), so we must use 2x Utmost Caution (2x 100 GP) to keep the final Wear at 30. Since we'll be spending GP on 2x Utmost Caution, we need to try to get as many FREE Discerning Eyes as we can. In order to get the most FREE DE, we will make use of Impulsive Appraisal. Any time a DE procs, we can then use it on the next Methodical Appraisal together with Single Mind and Utmost Caution. This way, we can spend most of our precious GP on Single Mind & Utmost Caution, and minimize the use of Discerning Eye. - No, I did not invent this wonderful rotation. An anonymous person did. I only created this figure. The beauty of this rotation is that even though it relies on RNG for the procs of DE, if nothing procs at all, you don’t lose any GP, so you can respawn the Ephemeral Node and do it again. The ultimate goal of the Ephemeral / Aetherial Reduction game is to obtain Landborne/Leafborne/Seaborne Aethersand. You can get them from lvl 56 items like Lightning Moraine, as long as you have 8/8 Purity. But the successful rate is very low. In contrast, it is known that you have a much better chance of getting these aethersands if you reduce from a lvl 58 or lvl 60 item like Bright Lightning Rock or Radiant Lightning Moraine with 8/8 Purity. In any case, if you want to obtain Landborne or Leafborne Aethersand, you must have 8/8 Purity on the Collectable. 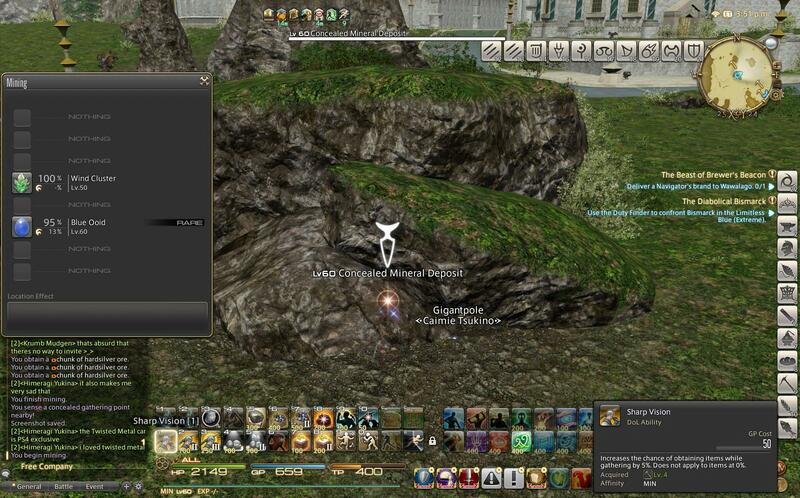 - Duskborne Aethersand can be obtained by both Miner/Botanist. It can be reduced from items with as low as 3/8 Purity. Dawnborne Aethersand can be obtained by both gatherers as well, but requires about 5/8 to 8/8 Purity. Higher Purity will give you a better chance of obtaining more precious aethersands. - Landborne Aethersand & Leafborne Aethersand can only be obtained from 8/8 Purity items. Lvl 58 & lvl 60 items (hidden) give better chances. Landborne is from Miner, while Leafborne is from Botanist. Seaborne Aethersand is from Fisher (not covered in this guide). 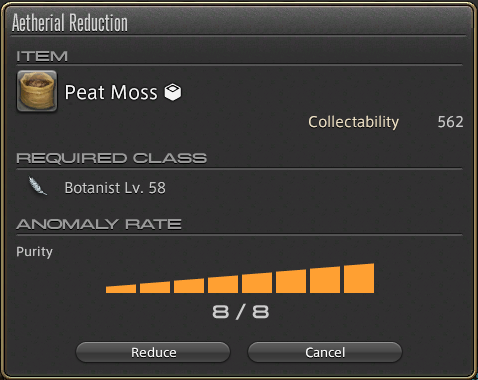 - You can get Landborne / Leafborne Aethersands from lvl 56 items of 8/8 Purity, but the rate is extremely low. It has only happened to me once. Lvl 58 & 60 items give much better chances. 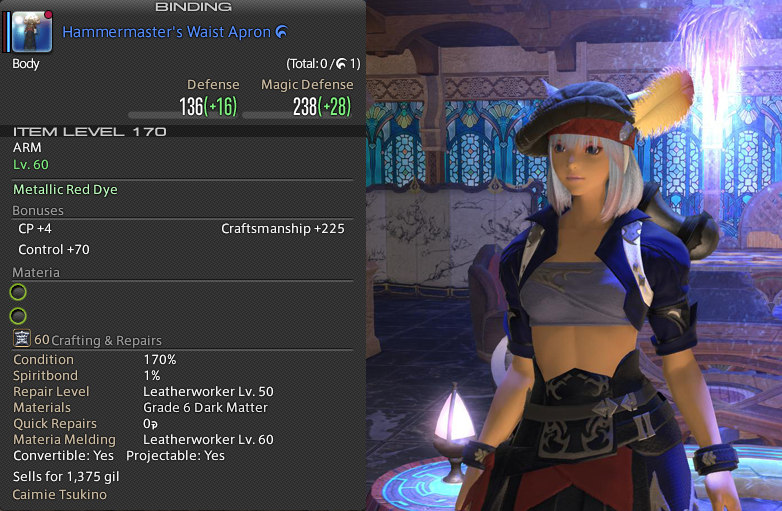 At level 60, one can take a quest called "Go West, Craftsman" from Lydirlona at Mor Dhona. Then speak to Tobana at Idyllshire (x6, y4). This will unlock "Favors". 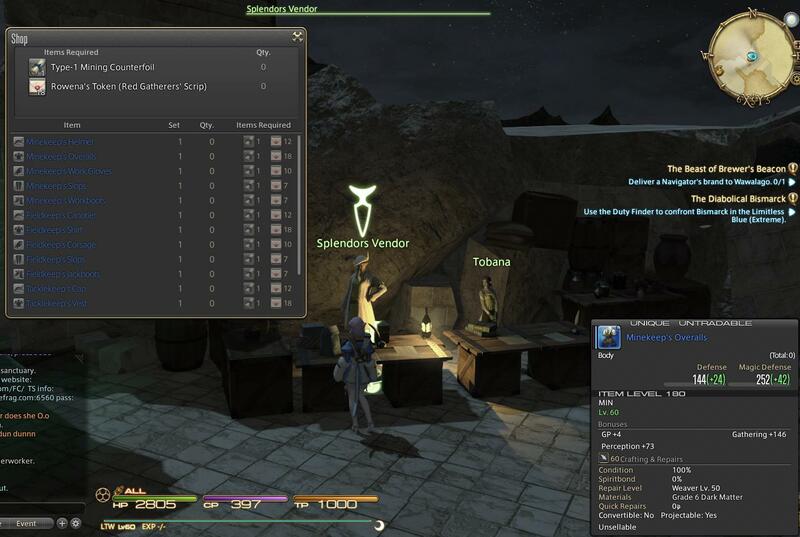 You can then purchase "Favors" from the Splendor Vendor at Idyllshire using "Rowena's Token (Red Gatherer's Scrip)". 1x Token will get you 5 Favors. A Favor is a item that gives you the ability to reveal Concealed Nodes at a specific area for 5 minutes (used to be 15 min before patch 3.07, and the appearing rate of Concealed Nodes was 300% less). Before you buy a Favor, you should first study what you intend to do with it. 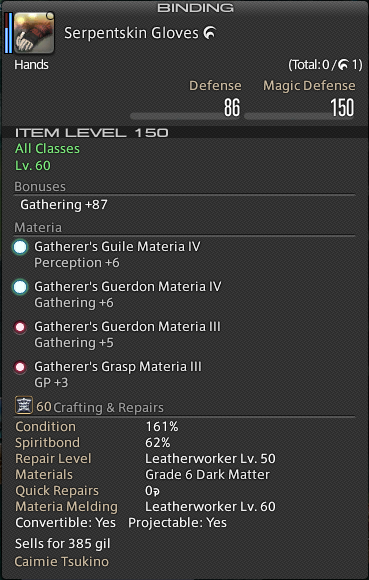 Favor mats are ultimately for making 2 star items (i170 DoH tools/gear/acc, i170 DoL offhands/acc, and i180 battle gear). First, as you can see from the picture below, Gathered Favor Mats (like Red Ooid & Wyvern's Wart) are to be traded for Favor Crafting Raw Mats (like Purified Coke). Ooids & Roundstones are from Miner Favors, while all the other weird ones are from Botanist Favors. 10x Miner Favor Raw Mats + 10x Botanist Favor Raw Mats + 1x Rowena's Token (Red Crafter's Scrip) = 5x Favor Crafting Raw Mats. A Roundstone is simply a rarer form of an Ooid. 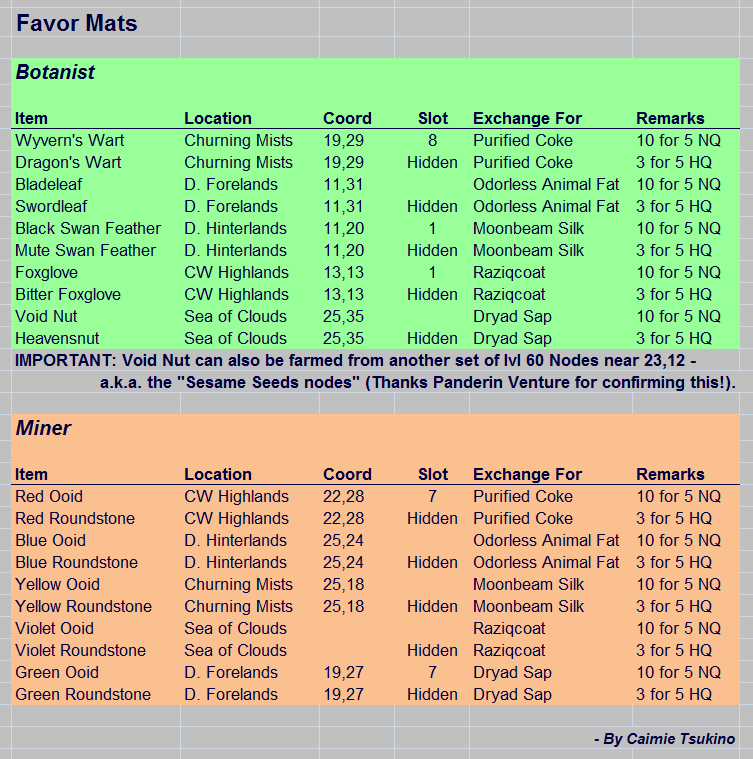 3x Roundstones + 3x Rare Botanist Favor Raw Mats will give you 5x HQ Favor Crafting Raw Mats. 5x Favor Crafting Raw Mats (e.g. Moonbeam Silk) are needed to craft 1x Crafted 2-Star Favor Mat (e.g. Griffin Leather, Astral Silk etc.). Astral Oil is a 1 star crafted item from ALC, made with 2 different Folklore items (Seventh Heaven & Astral Moraine). *Note: This is HQ item. NQ does not have as much stats. And then lastly, 4x Crafted 2-Star Favor Mats are needed to craft 1x i170 meldable chest piece (crafted 2-Star gear) for DoH, or 1x i180 meldable chest piece for DoW/DoM (Hats, gloves, boots & accessories require fewer mats). Note: Only crafted i170 offhands & accessories are available to DoL. No DoL mainhand or gear available! This is probably why the quest was called "Go West, Craftsman!" - it's mostly for crafters. Because of such ridiculously gated mechanisms, we don't see too many i170 available for sale at all. And any i170 on the marketboard will be "legitimately-ridiculously-high-priced" (wonderful oxymoron). Before you start gathering Favor Raw Mats, you need to have a goal. Is there a particular 2-Star item that you want? Or do you just want to sell these precious mats for gil? 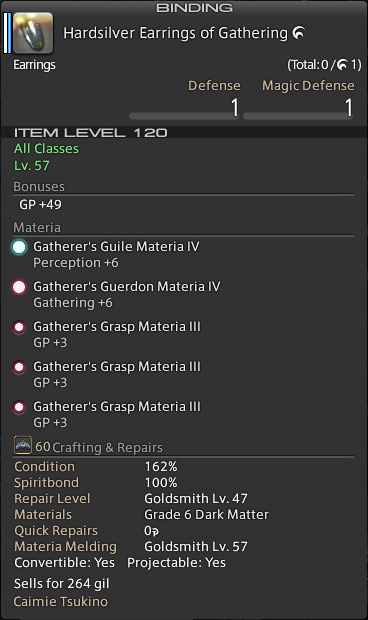 If you just want gil, easy enough, check the marketboard for an item that no one is selling yet. But if there's a specific gear you want, you'd better first find out exactly what Favor Raw Mats are needed. Every 5 Favors cost 1x "Rowena's Token (Red Gatherer's Scrip)", which is equal to 50 Red Scrips. Assuming you get about 10x Favor Raw Mats per 5 Favors purchased, you will need 2 Tokens (100 Red Scrips) to get 5x Favor Crafting Raw Mats (which is used for 1x Crafted Favor Mat). You need 4x Crafted Favor Mats per gear, so you need 4x 100 = 400 Red Scrips to craft 1x 2-Star Gear. We can only get 450 Red Gatherer's Scrip per week. So this is practically using up nearly a whole week's quota to make 1x 2-Star Gear! And yet, the nonsense is not over yet... We'll now go into how "Favors" actually work. When you use your Favor, you gain a buff for only 5 min that allows you to detect "Concealed Nodes" in the specific area of that Favor. The problem is, the Concealed Nodes don't just show up for you. They need to be "spawn" by depleting near by regular lvl 60 nodes. Every time you deplete a regular node near the spawn area, there's only approximately 30% chance that the special Concealed Node will show up for you on the mini map near those regular nodes. Once showed up, you need to rush there quickly and engage the Concealed Node. The Favor Raw Mat will show up as a "RARE" item, which means you can only collect it once. Sorry, but King's Yield II doesn't work. You can't increase the yield. It is THIS RNG game that pisses off most people. You can use a Favor and potentially get nothing if unlucky. ... and there goes 50 precious Red Scrips! I barely made it over 10 Ooids. If I had less than that, I would have needed to spend another 50 Red Scrips for more Blue Ooids to make 1 leather. It's really scary! And I need to do this Favor bullshxt at least 8 times (8x 5 Favors) before I have a chance to craft a 2 star i170 chest piece (other gear/accessories are slightly easier). And finally, if I NQ or botch the final product, then I would have wasted nearly an entire week's Red Gatherer's Scrips and hours & hours of work! So at this point, you may say: "Screw this! I might as well just directly exchange my tokens for i180 gear, which requires no extra gathering work, no crafting work, no favors, no freaking RNG game!" I agree with you. The unmeldable i180 takes much longer to acquire because it cost much more Crafter's Red Tokens to trade for. The crafted i170 chest pieces need only 4 Crafter's Red Tokens, where as i180 chests need 18 Crafter's Red Tokens (50 scrips = 1 token). 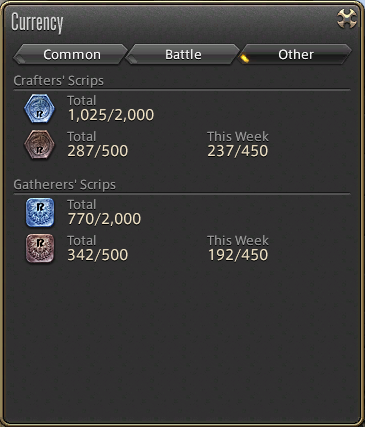 That's half a week's Crafter's Red Scrips (200) vs 2 week's Crafter's Red Scrips (900). i180 is also probably slightly weaker than a fully-melded i170, they will have similar stats. However, on the good side, if you just go for i180, you don't need to do all these crazy hours of Favors, or worry that RNG will screw you over. You also don't need to worry about the notorious bank-breaking overmelds later, and how to acquire rare Tier V materia to max the caps. To me, the reason I want the crafted i170 so badly is that they can be dyed while i180 cannot. And being a crafting fan, I just want to try at least one or two 2 star item. But if you are not interested in these things, and if you don't plan to sell Favor mats for gil, then you might as well skip the entire Favor game, and save yourself from any nightmare, and just trade your tokens for i180. Favor mats do sell VERY well though. 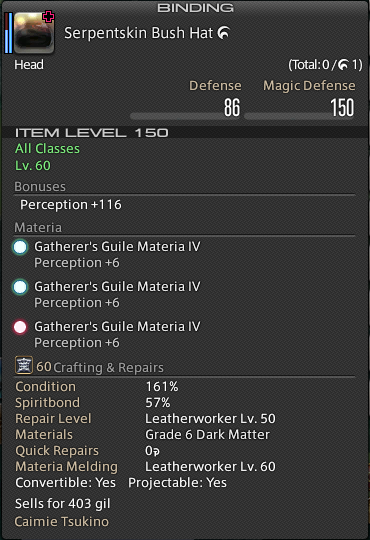 I have sold some of my extra Favor mats, and earned quite a bit of gil. - i180 can be exchanged directly using Rowena's Token (Red Crafter's Scrip). It costs 18 Tokens for the chest piece. Comparing to the crafted one, the crafted one only need ~8 Red Gatherer's Tokens & 4 Red Crafter's Tokens. But the crafted one requires soooo much more work, and relies a lot on RNG. (1) Find out which Favor gives you the desired item, and buy it from the Splendor Vendor. (2) Bring some cordial with you, just in case. (3) Prepare at least 6 to 7 empty spaces in your inventory. You won't have time to discard items during Favors. 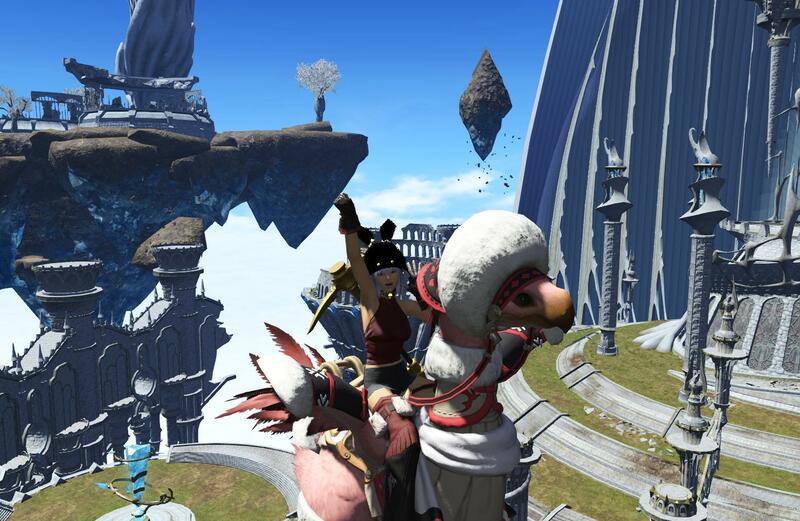 (4) Have your flying chocobo/mount ready as a button on your hot bar. You will need to fly between nodes quickly. (4) Set busy mode by typing "/busy" in the chat box. (5) Surveil the Concealed Node area. 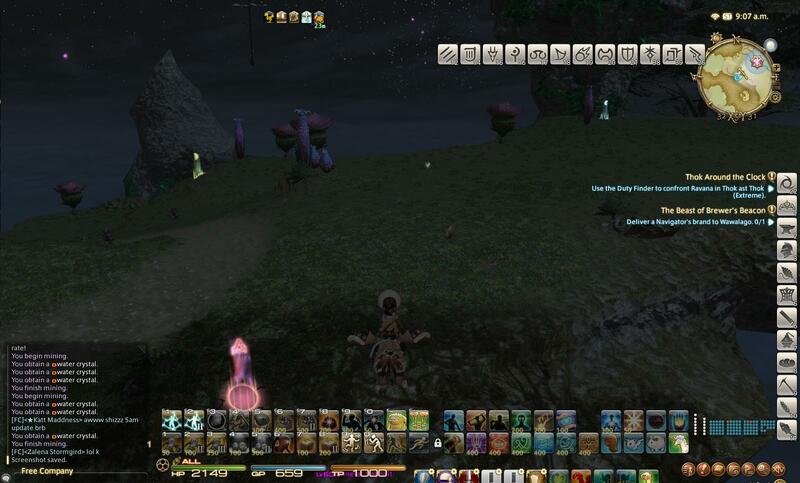 Familiarize yourself with the location of the regular lvl 60 nodes, and pay attention to where monsters are located. Learn where to land your chocobo safely, and find out when you need to pop "Stealth" to avoid getting killed. (7) Hit 4 normal nodes until they have only 1 attempt remain (to speed up the depletion process once Favor is active. See Remarks D below). Don't do this for all 6 nodes in the area. If you work on the 5th node, the 1st node will restore all its attempts. (8) Pop your Favor, and deplete those regular nodes one after another (it doesn't matter what item you collect), while paying attention to the screen & mini map for the signs of a Concealed Node. (9) Once a Concealed Node is found, fly there quickly, and pop Stealth if necessary. (10) You do not need to uncover the item(s). The Favor mats will show up at 95% success rate. DON'T WASTE TIME on Sharp Vision / Field Mastery to increase success rate to 100%. Just hit it at 95%! No complicated rotations needed. You have many attempts, so you won't fail in getting it. 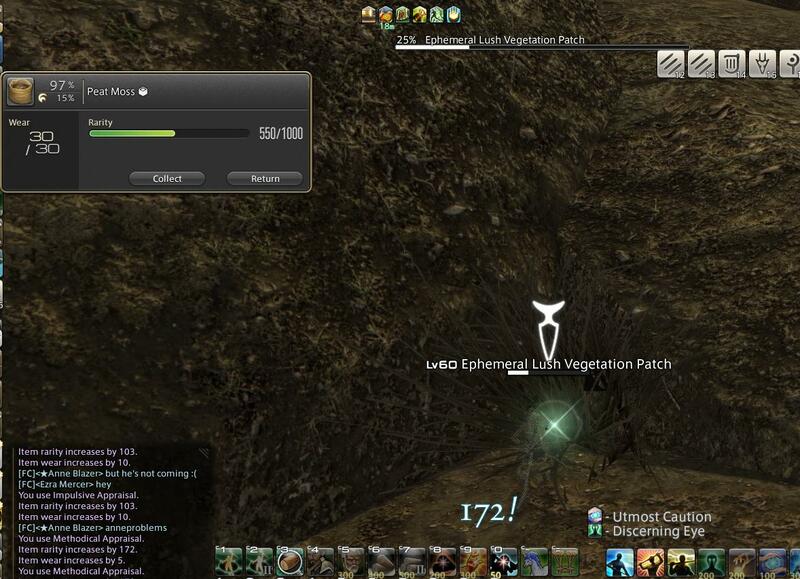 If a HIDDEN FAVOR MAT like a Roundstone is present in addition to the regular Favor Mat, use Sharp Vision III / Field Mastery III to increase it to 100% before harvesting both. (11) DO NOT waste time on clusters. DISENGAGE from the Concealed Node right after all the Favor mats are collected. New Concealed Nodes will OVERRIDE those half-harvested Concealed Nodes that still contain clusters. The existing Concealed Node has absolutely NO EFFECT on the spawning of new nodes. (A) I have confirmed that as long as you are engaged onto a Concealed Node, even if the Favor timer is up, your Concealed Node will still be remain open, and you can still harvest from it. So, as long as you engage the node before the Favor is gone, you can take your time to work on the Favor item(s). (B) I have even confirmed that as long as the Concealed Node APPEARS before the Favor timer is up, it will still remain AVAILABLE after the Favor timer reaches zero. You can still go to it, and harvest from it. (C) The presence of Ephemeral Node has NO EFFECT on the spawning of Concealed Nodes (see pic below). They can be around, and Concealed Nodes will still pop just fine. However, you gotta be careful not to be confused by it with the regular nodes, or you waste your time. (D) It is confirmed that, before you pop your Favor, you can harvest from a regular node until there's only 1 attempt left, then you disengage from the node, and then pop your Favor, then you engage the node again, and deplete the node with only 1 attempt. A Concealed Node CAN actually appear from this action (I've done it before!)! This will shorten the depletion of your nodes by a few seconds. Does it matter? Yes, a few seconds do matter! There has been more than once (at least 3 times), that my final 10 seconds of a Favor got me something. So a few seconds do matter! (E) The 6 nodes are usually grouped into sets of 2. Concealed Nodes CAN appear twice per set of 2. That is, if a Concealed Node appeared after you depleted Node#1 in a set of 2, it may appear again after you depleted Node#2 in the same set of 2. 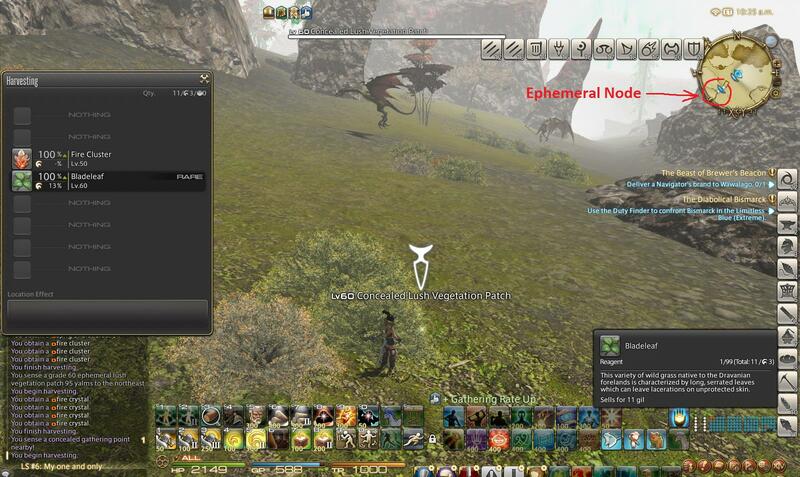 Thus, do not skip Node#2 just because a Concealed Node appeared after Node#1 was depleted. - This is what it looks like when a Concealed Node appears. - After engaging the Concealed Node, just hit it! No complex rotation needed. - The spawning of Concealed Nodes is not affected by any nearby Ephemeral Nodes. - Waymarks are your best friend! Use them! See how clear it is to where you need to go? - Changing the color of the nodes also helps to visualize them (especially in day time). Notice how I placed the waymark "A" at high ground so I can see it from far away even if there's a small hill between the node sets. - Concealed Nodes can sometimes appear at slightly different coordinates in the same zone. Total - 15 Bladeleaf & 1 Swordleaf - It was much more successful than my Blue Ooid run. Total - 15 Green Ooids. Total - 14 Green Ooids. Total - 9 Void Nuts - pretty bad run! Total - 10 Void Nuts & 3 Heavensnuts. 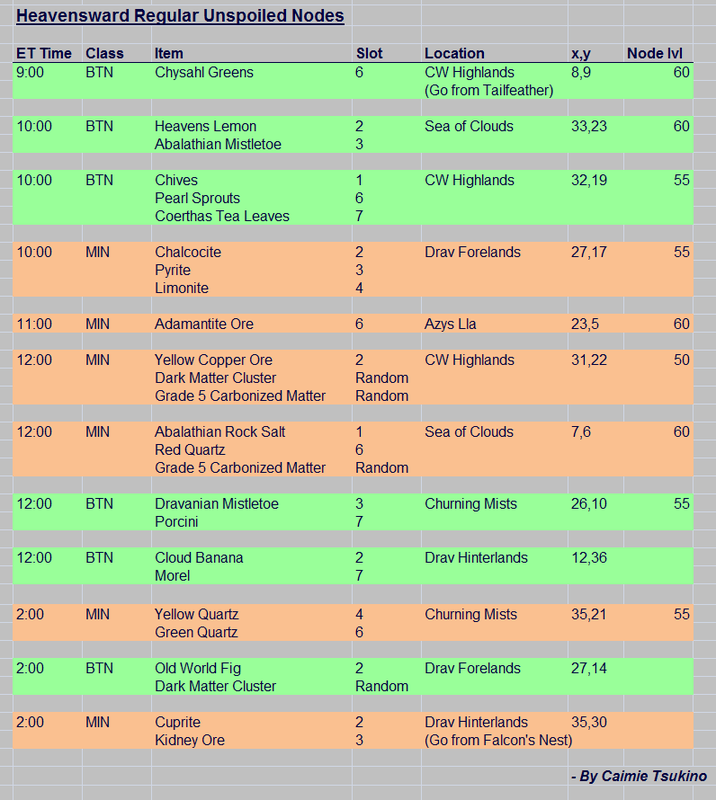 Total - 9 Yellow Ooids & 1 Yellow Roundstones - Bad run! Total - 16 Yellow Ooids & 2 Yellow Roundstones - Good run! After Patch 3.07, the average yield for regular Favor mats are (15+14+18+9+10+9+16+10+12+14) / 10 = 12.7 items per 5 Favors (calculated from the above 10 Favor runs post 3.07). The average yield for Hidden Favor mats are (0+0+4+0+3+1+2+2+1+1) / 10 = 1.3 items per 5 Favors. In 1 Favor (5 real life min), I can gather from 12 to 13 nodes, including the Concealed Nodes. Let's say 12 for now to make calculation easier. Total number of nodes mined in 5 Favors = 12 x 5 = 60 nodes. Out of 60 Nodes, 12.7 Favor mats were harvested, thus 12.7 Concealed Nodes were within the 60 nodes. 60 - 12.7 = 47.3 regular nodes depleted in the process. Appearing Rate of Concealed Node (every time you deplete a regular node) = 12.7/47.3 = 26.8%. In the 3.07 Patch Notes, S-E said they increased Concealed Nodes appearing rate by 300%. So I assume this means 4 folds? If that's the case, the previous appearing rate before the patch was around 6.7%. Out of the average 12.7 Concealed Nodes in 5 Favors, 1.3 Hidden Favor mats appeared. Appearing Rate of Hidden Favor Mats per Concealed Node = 1.3/12.7 = 10.2%. Highest number of Concealed Nodes I got within 5 min = 7 (happened once). Lower number of Concealed Nodes I got within 5 min = 0 (happened a few times). Most other times, it's somewhere between 1 to 4. HellsWrath, Stopfer, DarthRok and 4 others like this.